Fire up the kettle and check this lot out. 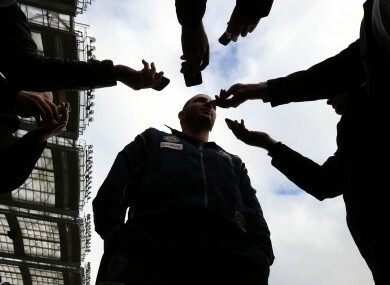 Tadhg Kennelly speaking to the media after an International Rules training session. In an excerpt from Will Leitch’s book Are We Winning? Fathers and Sons and the New Golden Age of Baseball — republished on Deadspin this week — we revisit the case of Steve Bartman, 10 years on. The Cubs fan was blamed for costing his team a world Series appearance when he deflected a foul ball. The Classical’s Fredorrarci on Gervinho’s journey from Arsenal to Rome and ‘something like redemption. 3. “On my wall at home is a picture of the 1999 Irish team that toured Australia. Dessie Dolan and myself were the two young lads in a squad managed by Colm O’Rourke. In this picture are some of the best footballers that ever played our great game. The likes of Peter Canavan, John McDermott, Trevor Giles, Anthony Tohill, Ciaran Whelan, Pádraic Joyce, Ja Fallon…I could go on. The opportunity to play under that management team and alongside these great players and to learn from them is something that stands out as one of the best experiences of my career. Dermot Earley gives his interesting take on the International Rules experience from a player’s perspective on GAA.ie. An interesting parlour game from Slate.com’s Josh Levin. One sport per state in the US. 5. “The devotion is so complete that residents of the city are often described not as fans, but as sufferers of a disease. Central supporters have been known as canallas, or scoundrels, since at least the 1930s, after the club was said to have refused to play a fund-raiser for Rosario’s leprosy patients. Newell’s, which had agreed to play, was nicknamed leprosos, or lepers. The rivalry began in 1905, when soccer in Argentina was still an amateur sport and clubs like Newell’s and Central were organized by British immigrants. Newell’s won the first match, 1-0. The New York Times’ Jonathan Gilbert on one of the keenest rivalries in world soccer. Email “Argentine football, rooming with Whelo and Steve Bartman: some of the week's best sportswriting”. Feedback on “Argentine football, rooming with Whelo and Steve Bartman: some of the week's best sportswriting”.